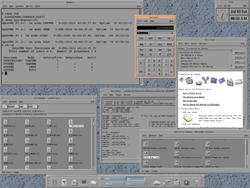 OpenVMS (Open Virtual Memory System), previously known as VAX-11/VMS, VAX/VMS or (informally) VMS, is a computer server operating system that runs on VAX, Alpha and Itanium-based families of computers. Contrary to what its name suggests, OpenVMS is not open source software; however, the source listings are available for purchase. Unlike some other mainframe-oriented operating systems, OpenVMS has a graphical user interface (GUI) with complete graphics support.